This option is used to hide or show the What field from the Homepage. ListingPro search system mainly works with 2 type of search modes. Based on the Exact match or Random match search results will be displayed in 4 combinations. It’s a default setting set by the theme. So based on the default search settings in Theme Options > Search Settings page (Search Mode: Exact Match, Default Search By:Title) if you type any term in the What field then results will be displayed exactly starting with the exact search term by following the rules of WordPress Default Search Engine. N.B: In the following example I’ve used “Auto” as a search term in What box. In the above screenshot, there are 4 different types of search results has been appeared. 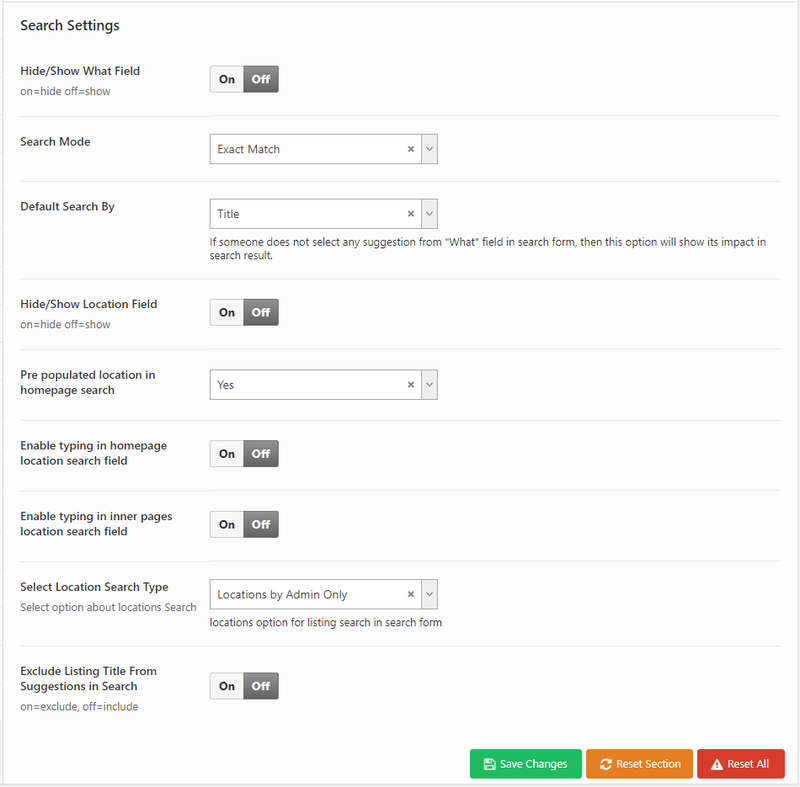 Based on your custom search settings in Theme Options > Search Settings page (Search Mode: Random, Default Search By: Title or Title/Keyword) if you type anything in the What field then results will be displayed randomly with suggestions as per the rules of custom search configurations. In the above screenshot, there are 4 different types of random search results has been appeared. Under this setting, there are two options available. 1) Title 2) Keyword/Tag. You can choose Title or Keyword/Tag as a default search handler. This option is used to hide or show the Location field from the Homepage. 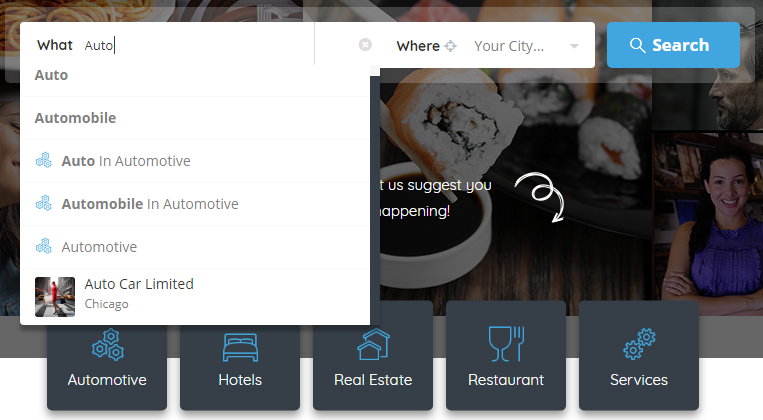 This option is used to automatically populate your current city inside of the Where box. If you set Yes then your current city name will be automatically populated based on the device IP. Google auto location target icon will be invisible. If you select No then you have to click on the circled target icon to generate your current city name based on your device IP. This option is applicable only for the homepage. If you want to enable typing (location name search by manually typing the location name) in the location then click On. If you click Off then location search by typing will be disabled in the frontend. This option is applicable for all other inner pages instead of the homepage. If you want to enable typing (location name search by manually typing the location name) in the location then click On. If you want to disable then click Off and location search by typing will be disabled in the frontend for all inner pages. In ListinPro Admin can manually add location from the backend or Admin can use Google Auto Location for managing locations. You can define which one will be used for the location search system. If Admin added any location name manually in the backend and if this option turned on then only manually added location list will be displayed inside of the dropdown of Where field. This option is used to display Google Auto Locations. If this option selected then only Google Auto Location list with suggestions will be displayed instead of manual locations inside of the dropdown of Where field. This option is used to exclude Listing Title in the search results. If this option turned on search suggestions will be appeared except Listing title. Circled Target icon is used for auto-populating city name. Once clicked city name will be auto-populated based on your device IP address, whether you have added the city in the system or not. 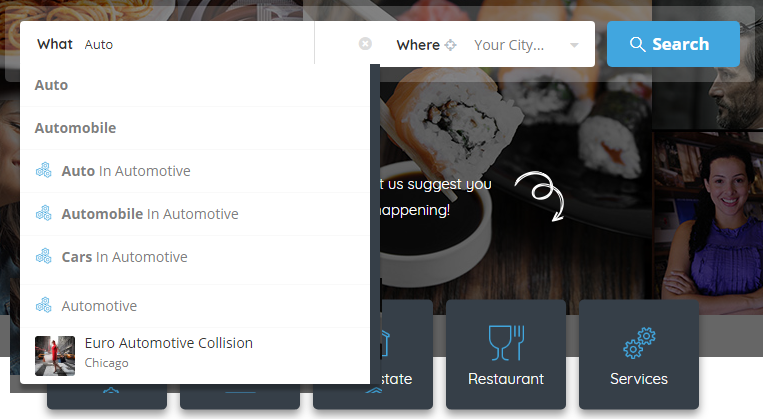 If there was no listing added to the auto selected City then the search result will be empty.